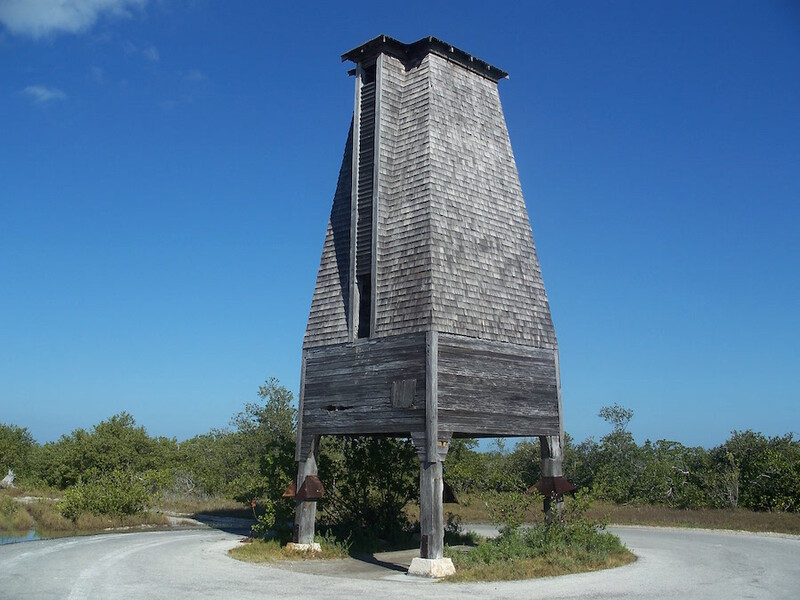 The architecture left demolished by hurricanes is sometimes difficult to measure in scale and cost, but one structure recently toppled by Irma on Florida’s Sugarloaf Key has prompted an entire community’s collective mourning. The Bat Tower is well-known for many reasons, chief among them the fact that it contains exactly no bats. It was commissioned in 1969 by a developer named Richter Clyde Perky who was hoping to curtail the rampant local mosquito population by propagating bats (a natural predator) within an artificial roost. Measuring 30 feet tall, the Gothic-inspired, shingled pine and cypress structure was adapted from a set of plans by “city bacteriologist” Dr. Charles Campbell, who developed the roost’s design after studying bats in west Texan caves. The interior featured roosting units in a honeycomb pattern, and bats could enter through a tall array of shutters on a dormer-like protrusion. Its construction cost $10,000 in total, which was quite a sum for the time and even today. Campbell’s goal was to eradicate malaria by reducing the mosquito population, using bats as the liquidating agent. In contrast, Perky just wanted to draw recreational fisherman to the Florida Keys, and mosquitos were bad for business. The Tower was meant to function as a natural insecticide offering some relief to the residents of the adjacent travel lodge he built—named, creatively, Sugarloaf Lodge. What followed the Tower’s construction was a series of trials in which Perky unsuccessfully tried a number of tactics to lure bat populations to his Chiropteran hotel. To aid in this process, Dr. Campbell supplied Perky “bat bait,” a foul compound of guano and the genitalia of female bats meant to draw hordes to the structure. Alas—no dice. The rest of the failed attempts at bat introduction are merely lore; what is sure is that the Tower never succeeded at its goal. Instead, it became a beloved artifact for locals, and was even added to the National Register of Historic Places in 1982. Its pinnacle was also reportedly home to ospreys for some time, a much fiercer predator feasting on fish from nearby waters. For preservationists, the Tower was an architectural rarity: Of the fourteen towers built worldwide from Dr. Campbell’s designs, Sugarloaf’s was one of just three still standing when Irma’s winds razed it to the ground. Some of the others, fortunately, successfully hosted bats. Upon the Bat Tower’s destruction, some locals and tourists have taken to toting away pieces of the tower as souvenirs, to the upset of Katchen Duncan, the tower’s proprietor. It is not clear whether a reconstruction is possible or probable, but Duncan has hinted that it is being looked into. “Everyone has a special place in their heart for the bat tower,” Duncan explained—and many have made their pilgrimage to the site to pay their respects to a beautiful failure.